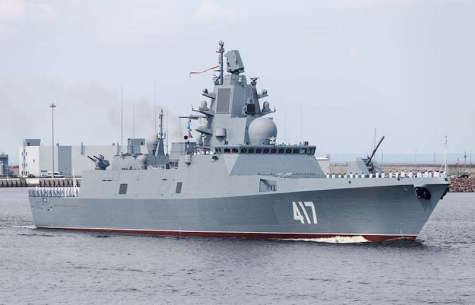 MURMANSK, Russia --- The Russian Northern Fleet’s missile frigate Admiral Gorshkov will enter the Atlantic Ocean on Friday after passing through the English Channel, Fleet spokesman Vadim Serga told journalists on Thursday. "Today, a group of the Northern Fleet’s ship and support vessels comprising the frigate Admiral of the Fleet of the Soviet Union Gorshkov, the multifunctional logistics vessel Elbrus and the rescue tug Nikolai Chiker has passed through the narrowest part of the English Channel, the Strait of Dover. Tomorrow, the naval group will complete its transit of the English Channel and will enter the Atlantic Ocean," the spokesman said. In their transit of the Strait, the naval group’s crews successfully practiced the tasks of joint maneuvering amid intensive shipping. The Northern Fleet’s ships and support vessels have covered a distance of over 2,000 nautical miles since they left the Fleet’s main naval base of Severomorsk. The frigate Admiral Gorshkov is the first surface ship in the Northern Fleet that carries Kalibr cruise missiles. It numerously accomplished inter-fleet passages from the Baltic to the Barents and White Seas to test air defense, missile/artillery and mine/torpedo armaments at the Northern Fleet’s sea ranges. In 2017 and 2018, the frigate took part in Russia’s Main Naval Parade in the Kronshtadt roadstead in the Gulf of Finland.